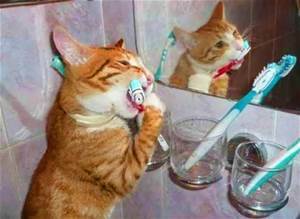 Preventive dental care can add two to four years to the life of your pet. Optimum dental care truly is a fountain of youth for your pet. 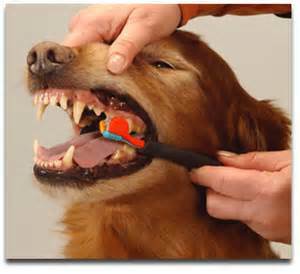 Your pet's dental and oral health are an important part of his or her overall health. 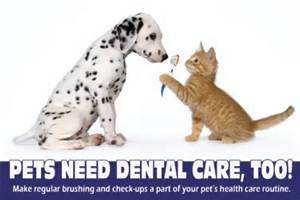 According the American Veterinary Dental Society, 80% of dogs and 70% of cats have oral disease by the age of 3 years. 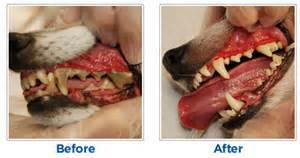 Periodontal disease is the most common disease in dogs and cats in the United States. Many health problems start in the mouth. Dental disease can dramatically affect your pet's organ functions. Plaque, tartar, periodontal disease, and infected teeth serve as a source of inflammation and infection for the rest of the body. Dental disease can lead to more serious conditions such as heart, lung, liver, or kidney disease. 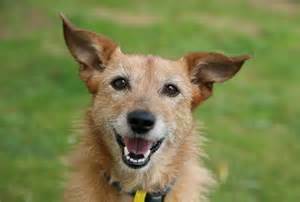 Further, many pets with untreated dental disease suffer from chronic pain and premature aging (often acting older than they should). Dental disease can occur in pets of all ages, but if your pet is three years of age or older, he or she likely has tartar and plaque build-up on the teeth and probably needs a dental cleaning. Older pets that lack preventive dental care and professional cleanings will have advanced tartar build-up and some degree of gum disease. The problem begins when plaque and tartar are allowed to build-up on your pet's teeth. Plaque harbors bacteria which can infect gum tissue and the root system of the teeth. This causes pain and can result in healthy teeth having to be extracted because the root structure has been compromised. The bacteria in the mouth can get into the blood stream and may cause serious kidney infections, liver disease, and heart valve disease. Oral disease can also indicate that another disease process is occurring elsewhere in a pet's body. A thorough physical exam combined with appropriate laboratory work can determine if this is the case. After the teeth are cleaned and polished, your veterinarian will perform a thorough oral exam and check each tooth for any signs of dental disease (gum loss, root exposure, pockets around the root). Extensive dental disease requires the tooth be removed (extracted). Many teeth require oral surgery to safely remove each individual root. We have extensive training and experience to perform these procedures properly. Oral nerve blocks are performed and additional injectable pain medications are administered, if teeth are extracted. Your pet will also be sent home with pain medications. pets recovery quickly following these procedures and, once the gums have completely healed, they resume eating their regular dry kibble, even when multiple teeth are extracted. The combination of regular dental examinations, professional cleanings, appropriate treatment, and preventive home measures, is the best way to prevent painful abscessed teeth and promote general good health. Remember each year of your dog or cats life is equivalent to 5-7 years of our life (pets age much faster than we do). Would you go for 5 -7 years without a dental check-up and cleaning? Some symptoms which may indicate oral disease include: bad breath, plaque build-up, tartar build-up, gum irritation, bleeding gums, red gums, changes in eating and chewing habits, pawing at the face, generalized depression, loose teeth, broken or fractured teeth, tooth discoloration, and swelling in the jaw area. 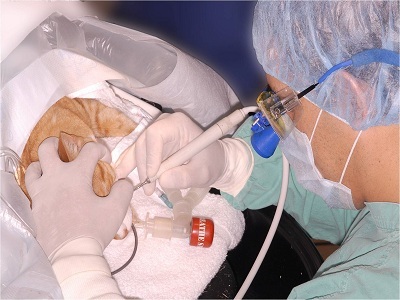 The American Animal Hospital association (AAHA) recommends regular oral examinations and professional dental cleanings, under general anesthesia, for all adult cats and dogs. AAHA recommends these procedures at least annually, beginning at age one year. 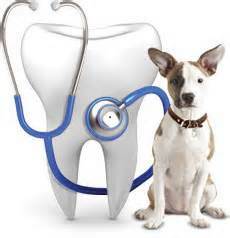 Your veterinarian should evaluate your pet's dental health at least once a year. This is recommended because bacteria and food debris accumulates around a pet's teeth and, if left unchecked, will lead to a deterioration of the soft tissue and bone surrounding the teeth. This decay results in irreversible periodontal disease and even tooth loss. There are two critical components of your pet's veterinary dental care: oral examinations and regular annual professional dental cleanings. Veterinary dental care begins at the puppy and kitten stage. As your pet ages, our veterinarians will look for developmental anomalies, the accumulation of plaque and tartar, periodontal disease and oral tumors. Veterinarians can perform a basic oral exam on patients that are awake. However, when a cleaning is required, your pet will need to be induced under general anesthesia in order to properly and safely examine and clean the teeth. We use modern and safe ultrasonic equipment and each tooth is thoroughly cleaned above and below the gum line. Dental technicians polish the teeth to create a smooth, shiny surface more resistant to plaque build-up. There are many ways that pet owners can help their veterinarian provide a healthy mouth for the pet. Our dental services at Ahwatukee Animal Care Hospital include teeth cleaning and polishing, tooth extraction, and oral surgery. We also recommend and demonstrate preventive measures you can begin at home. Soft plaque on teeth turns into hard tartar, and bacteria, food particles, and enzymes invade the gums, causing potential periodontal disease and a number of related health conditions in dogs, cats, and other pets. In the past decade, pet foods have been developed with the purpose of helping to remove plaque before it causes more serious dental problems. In order to do this, pet food researchers looked at a number of factors, including the size of the food pieces, the texture, the fiber content, and the manner in which the food breaks apart when chewed. Using these findings, they have been able to design foods that actually help to remove plaque and tartar as your pet eats. We see definite improvement in the oral health of pets that are fed dental diets, even if it is not their only food. Some pet owners feed a regular maintenance food in the morning and give a dish of dental diet food for the evening meal. Others use individual pieces of dental diet as treats (it tastes great!). For pets with a serious tendency toward tartar problems, the dental diet can be fed as the only food, since it is a complete balanced diet. Please visit with our veterinarians to determine the best diet and learn about other appropriate treats for your pet. This is not a replacement for a veterinary consultation. If you have any questions or concerns regarding your pet's health, please contact us for an appointment.